On the 22nd of August, 1798, the French frigates Concorde, Franchise, and Medee, carrying 1,070 French troops, 3 light field cannon, and 3,000 muskets, made landfall at Kilcummin Head. This tiny force, together with its Irish allies, was to conduct an extraordinary campaign that shook the British Empire. The notion of a French invasion of Ireland in cooperation with a native anti-British uprising was neither new nor incredible. In December 1796, General Hoche’s expedition of 12,000 troops in a flotilla of 35 ships had anchored in Bantry Bay; only the sudden onset of near-hurricane weather had prevented their landing. Ireland was in ferment. Widespread resentment of English rule, of gouging landlords, and of brutal discrimination against the Catholic majority had been fanned and, in amateurish fashion, organized by the United Irishmen movement. Theobald Wolfe Tone, one of the founders of the United Irishmen and a commissioned officer in the French Army, had lobbied ceaselessly in Paris for a coordinated invasion and uprising, including two interviews with General Bonaparte in early 1798. 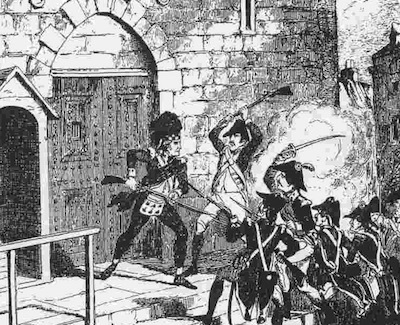 Heavy-handed actions by the forces of the Crown had sparked armed rebellion in Ireland beginning in May 1798, with bloody fighting raging through counties Meath, Carlow, Wicklow, Antrim, Down, and especially Kildare and Wexford into July. Into the relative quiescence of northwest Ireland, the French expeditionary force fell like a thunderbolt. Young General Jean-Joseph-Amable Humbert (the landing occurred on his 31st birthday), a canny veteran of irregular warfare against the insurgents of the Vendee, was well aware of the odds against him in a conventional military showdown, but also of the multiplying effects of surprise and speed. He was also keenly aware of the importance of early victory for exciting the morale of the Irish insurgents and dismaying the ill-trained loyalist militia. The first military confrontation occurred on the afternoon of 22 August, when Colonel Jean Sarrazin led 300 French Grenadiers south to the nearby village of Killala. The garrison of 80 men included a handful of regulars of the 17th Foot (Leicestershire Regiment), but was mostly composed of the Yeomanry, an ill-trained part-time paramilitary constabulary. With a portion of Sarrazin’s force circling around the British left flank and the remainder pressing a frontal attack with the bayonet, the unnerved Loyalists fired one ragged volley and then fled in terror. Three Frenchmen were slightly wounded. This initial humbling of their oppressors had the desired effect on the local population, bringing forward thousands of eager, though ignorant and ill-disciplined Irish volunteers who were hastily equipped and formed into companies. Muskets were issued to some, but as in the uprisings elsewhere in Ireland that year, most of the insurgents were armed with crude pikes, scythes, and hay-forks. On the 24th of August, Sarrazin (provisionally promoted to General de Brigade by Humbert on 23 August) led forward a mixed force of some 500 French and Irish against the next garrison town to the south, Ballina. Colonel Sir Thomas Chapman, commander of the Ballina garrison, advanced boldly up the Killala road at nightfall with a force of several hundred Prince of Wales Fencibles and Yeomen. About a mile north of Ballina, Chapman’s force confronted the French, and a brisk fire-fight ensued. The British were holding their own, until out of the darkness on their left burst a howling mob of pike-and-musket-armed Irish rebels led by French Colonel Fontaine. The British broke and ran. The British commander in County Mayo, General Hutchinson, expected Humbert to continue south along the only decent road out of Ballina toward Castlebar, the commercial and strategic center of the region. Where the road crosses the River Moy at Foxford, Hutchinson placed a strong blocking force with ample artillery. Clashes of French and British patrols along the Ballina-Foxford road appeared to confirm British expectations. In reserve at Castlebar itself, Hutchinson (superseded in command at midnight, 26-27 August, by Lieutenant-General Lake) had 1,610 men: 1 company of the 6th Foot (1st Warwickshire Regiment), a half-battalion of Fraser’s Fencibles (Scots), a battalion each of the Longford and Kilkenny Militias, 1 company of Galway Volunteers, 1 squadron of Lord Roden’s Fencible Dragoons, 4 squadrons of the 6th Carbineers, and 11 guns. Humbert, closely questioning the locals, learned that there was an alternative route to Castlebar, a barely-practicable goat-trail that ran west of Lough Conn, over the Windy Gap pass, and then south to the town. He resolved to take this route. To further the deception, the Franco-Irish forces marched out of Ballina along the Foxford road at sunset on August 26 with ostentatious noise and shouted boasts of expected victory at Foxford, then doubled back in silence and darkness to the west of Loch Conn. At midnight, Humbert’s army was in Lahardane. The local priest, Father Andrew Conroy, was fluent in French from his time at seminary in Nantes. He gave precious directions to the French officers and marshalled the people to provide food and assistance to the troops. In the aftermath of the campaign, LahardaneFather Conroy was arrested, tried, and executed by the vengeful British. After a rigorous night-march of 40 km (25 miles), Humbert’s 800 French, 1,500 Irish, and 1 laboriously manhandled gun reached Castlebar at 8 AM on 27 August. The British had been saved from total surprise by a farmer, who had spotted the approaching army an hour before and raised the alarm. They assumed a defensive position on Sion Hill, northeast of the town, in three lines: In the first line were the Prince of Wales Fencibles, the Warwickshires, the Kilkenny Militia, and most of the artillery. In the second line were the Fraser Fencibles, the Galway Volunteers, and two guns. The Longford Militia were in the third line. The cavalry were in reserve. Humbert spent the next few days resting and reorganizing his army, absorbing many hundreds of new Irish volunteers including some 250 deserters from the Longford and Kilkenny Militias. The “Republic of Connaught” was proclaimed and a makeshift revolutionary government installed. It was obvious that after the fiasco of Castlebar, the Crown forces in Ireland would marshal every possible resource to crush Humbert. Lord Cornwallis (the same who had surrendered to Washington at Yorktown), now the Viceroy and Commander-in-Chief in Ireland, moved French Hill monument, south of Castlebarwest from Dublin to take personal command of the campaign. By the 2nd of September, Cornwallis had 7,800 men, including two reliable Scottish regiments (the Sutherland and Rehy Fencibles) concentrated at Tuam, organized into four brigades under Generals Hunter, Campbell, Hutchinson, and Moore (later the hero of Corunna), and a further 2,800 at Boyle. Cornwallis advanced from Tuam on the 4th of September, but on arriving at Castlebar on the 5th found only a small Franco-Irish rearguard. Aware of the impossibility of defeating the well-equipped and far more numerous Crown forces, and with no sign of reinforcements from France, Humbert had marched off to the east on 4 September, hoping to evade the British cordon and blaze a trail of revolution across Ireland. With great luck, he might raise a large enough force of Irish rebels to break through to Dublin and conquer the country. In another feat of hard marching, Humbert’s army moved 50 km northeast to Tobercurry, where late on 4 September he routed a small body of Loyalist Yeomen under Captain O’Hara. O’Hara alerted the commander of the garrison at Sligo (a further 34 km to the northeast), Colonel Vereker. On the morning of the 5th of September, Vereker marched out with between 300 and 400 men of the Limerick Militia, 20 Essex Fencibles, 30 Yeomanry infantry, 20 men of the 24th Dragoons, 30 Yeomanry cavalry, and two guns. He took up a position just north of the village of Collooney, with his left protected by the Ballysadare River and his right anchored on a steep, wooded hill. The French advanced on the right along the river, while the Irish rebels deployed to the left. Collooney: Hill anchoring the British rightStatue of Bartholomew TeelingTheir advance was held up by the fire of the Loyalist guns, one of which was directed by a gunner of uncommon skill. In what may be one of the greatest feats of individual bravery in the long history of the Revolutionary and Napoleonic Wars, Colonel Bartholomew Teeling, a United Irishman holding a French commission, galloped forward alone to the British line, pistolled the enemy gunner at point-blank range, and rode back unscathed under a hail of musket-fire. Inspired by his example, the Irish and French surged forward and routed the Loyalists. On 6 September, having received word of an uprising that had broken out on the 4th in Counties Longford and Westmeath, Humbert turned south in hopes of linking up with these new allies. Meanwhile, the British pursuit was intensifying. Approximately 17,000 troops were now involved, with one army under Cornwallis maneuvering to stay between Humbert and Dublin, while the other under Lake dogged Humbert’s steps, sweeping up stragglers and abandoned guns. Especially active and effective in the pursuit was Lieutenant-Colonel Robert Craufurd, commander of Lake’s advance guard, later to give brilliant service in the Peninsular Campaign. Humbert’s army was brought to bay at Ballinamuck on the 8th of September, 1798. The main body of both the French and Irish contingents were drawn up on Shanmullagh Hill above the village, while Blake’s Irish battalion and a French Grenadier company under Capitaine Jobit blocked the road from the north along which Lake was advancing. Hompesch’s Mounted Rifles, a Hessian unit forming Lake’s vanguard, engaged this detachment. Jobit’s Grenadiers advanced, but became mired in boggy ground and were unable to escape when heavy British reinforcements arrived from the southwest. Blake’s Irish withdrew through the village and emplaced the two remaining guns astride the road, facing north. Following up Blake’s withdrawal, several companies of British foot and horse ascended the hill toward the main Irish position. Twice, they were repulsed by counter-charges of Irish pikemen. General Lake then sent a large force on a flanking movement around the base of the hill. The French and Irish withdrew a short distance to the east and south.Humbert’s Surrender When the British grand assault poured up the hill from three sides, in overwhelming numbers, Humbert gave the order to surrender. Humbert and his French were treated with all the consideration that could be given to gallant prisoners after an honorable defeat. Not so the Irish. Accounts vary, but it appears that many of the Irish were cut down where they stood, or driven into the bog south of the hill where they were hunted down and slaughtered. Captured Irish officers, even those bearing legitimate commissions in the French army, were seized and hanged as traitors. Such was Bartholomew Teeling’s fate. Down on the road south of the village, Gunner Magee was earning his place in the pantheon of Irish heroes and martyrs. With only one gun remaining and only a small body of pikemen in support, Magee’s crew fired round after round, exploding an English ammunition wagon and holding off the redcoats until this gun, too, was disabled. The campaign was over. The French prisoners, numbering something over 800, were conducted to Dublin. Within a few weeks, they were exchanged and repatriated. The Irish Rebellion of 1798, though brutally suppressed, lived on in legend and song, and became an inspiration to the Irish people in the long struggle against British hegemony. “It wasn’t just the resounding victory of the battle of Castlebar that made people sit up and take note, it was the principles of Republicanism the French brought to Ireland - liberty, equality and fraternity - that left a lasting legacy,” argues Mayo historian Stephen Dunford. “When Ireland rose again in 1916, Pearse, Clarke and the other leaders of that rebellion looked to the likes of Wolfe Tone, John Moore and Bartholemew Teeling for inspiration.